The Old Town – Gamla Stan – remains one of the most beautifully preserved attractions in all of Europe. 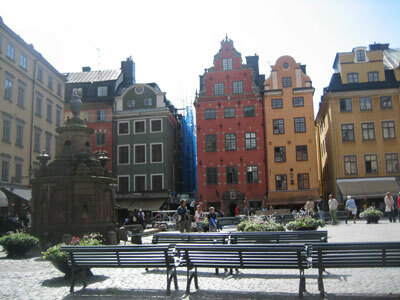 This medieval city is also one of the biggest and most popular city centers in Stockholm. In fact, back in 1252, this is exactly where Stockholm was founded. When you visit Stockholm and head over to Gamla Stan, you can expect to be immersed in a friendly place which is filled with restaurants, bars, boutiques, cafés, and different attractions. If you love shopping and collecting souvenirs and handicrafts, then you’re in the right place. The place features nostalgic cobblestone streets which are narrow enough to give it a historic, small town feel. Many of the buildings are in gold – quite literally – which makes Gamla Stan even more eccentric and one-of-a-kind. Middle Ages frescoes and cellar vaults can still be found here, to this day. During the winter, the snow adds to the storybook ambiance of the place. You can also see several museums and churches here, such as the world-famous Nobel Museum and the Stockholm Cathedral (Sweden’s national cathedral). The Royal Palace is also found here, which is an important landmark for both Sweden’s tourism and history. All of these attractions are more than enough reasons to free walking tour Stockholm. If you’re thinking of having a different kind of vacation, then you should give Gamla Stan a good try.